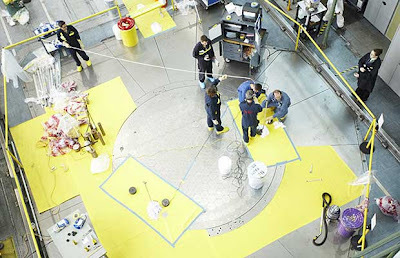 This is a July 8, 2009 handout photo from Atomic Energy of Canada Limited. The federal Conservative government tossed more than $183 million into Atomic Energy of Canada Ltd. in the first three months of the fiscal year — nearly double the total annual budget — even as it was selling off the nuclear reactor division for just $15 million, plus royalties. The federal Conservative government tossed more than $183 million into Atomic Energy of Canada Ltd. in the first three months of the fiscal year — nearly double the total annual budget — even as it was selling off the nuclear reactor division for just $15 million, plus royalties. A new report from Canada’s parliamentary spending watchdog also shows that while the Harper government is on pace to find its overall expected budget savings, it has seen massive expenditure hikes in some departments as the Tories implement their tough-on-crime agenda. The expenditure monitor released Tuesday by Parliamentary Budget Officer Kevin Page keeps MPs and senators up to date on spending trends across federal departments and agencies. In his assessment, Page says the Conservative government should hit its total expenditure targets, but is still increasing operational spending when there is supposed to be a freeze across departments. Indeed, some agencies and departments have already spent huge chunks, if not all, of their annual budgets in the first three months of the fiscal year, raising questions about where the government will find additional cash. Atomic Energy of Canada Ltd. — the financially troubled Crown corporation whose commercial operations are being sold to SNC-Lavalin — received approximately $183 million in government payments in the first quarter alone, nearly double its $102 million voted budget for the entire 2011-12 fiscal year. Approximately $114 million of that government funding was invested in the spun-off nuclear reactor division that was sold in the same quarter for only $15 million plus royalties to SNC-Lavalin, the Montreal-based engineering and construction giant. The government, as part of its decision to privatize the Candu division of AECL, is facing a $59 million restructuring charge and “$93 million in adjustments to revenue and costs resulting from AECL’s subcontract agreement with Candu Energy Inc.” — the newly created subsidiary company of SNC-Lavalin. Federal spending on the sold-off nuclear reactor division includes cash to “further Commercial Operations’ progress on life extension reactor projects” that will be factored into future royalties paid back to the government. Under the terms of the sale of the commercial division, the government and AECL must provide up to $75 million in support toward the completion of the Enhanced Candu Reactor development program. The sale — which was announced in late June and is slated to close by Friday — likely will also see more than 800 people lose their jobs. SNC-Lavalin has committed to hiring about 1,200 of AECL’s commercial operations staff, which totals around 2,025. The federal government will retain the Nuclear Laboratories division of AECL, which operates the Chalk River, Ont., nuclear facility, which produces isotopes for medical imaging. Approximately $69 million of the first-quarter expenditures were directed to the research business that’s still in government hands. AECL’s commercial division designs and builds Candu reactors for nuclear generating stations. The federal government put the unit up for sale in 2009 after several years of financial troubles and hundreds of millions of dollars in taxpayer subsidies. SNC-Lavalin, Canada’s biggest engineering and construction firm, was the sole bidder. Natural Resources Minister Joe Oliver wasn’t available for an interview on Tuesday, while department officials also declined comment. When the sale was announced in June, Oliver said cost overruns in the nuclear reactor division contributed to total funding of $1.2 billion over the past five years. “This is the best deal, in a difficult domestic and international environment. It preserves the Candu business, which has been a challenging situation, and allows Canadians to benefit from its success,” Oliver said in June. But it isn’t just AECL that has seen large spending hikes during a time the federal Conservatives are urging fiscal restraint. The Correctional Service of Canada has seen its capital expenditures soar 271 per cent over the same quarter last year, due to newly enacted tough-on-crime legislation and a subsequent projected increase in the offender population. “It’s sure hypocrisy to preach restraint when your spending on an ideological crime agenda is out of control,” argued Liberal finance critic Scott Brison. The government’s new Truth in Sentencing Act alone will cost taxpayers an estimated $458 million this year. Opposition parties say they believe an omnibus crime bill currently being debated in the House of Commons — which would crack down on young offenders, drug dealers and sexual predators — could cost billions of dollars. Page is urging the federal Tories to identify the expected costs of its criminal reforms, and is worried the government hasn’t properly budgeted for the measures. The Correctional Service of Canada has said it will need to hire more than 3,000 employees to handle an influx of 4,000 new federal inmates anticipated under the Conservatives’ tough-on-crime strategy. And CSC commissioner Don Head has previously predicted about half of Canada’s 57 federal penitentiaries will be renovated and expanded in the next four years to cope with an influx of new prisoners expected as a result of the Harper government’s tougher sentencing laws. This entry was posted in Energy, Their Governments and tagged Nuclear. Bookmark the permalink.